PITTSBURGH – 2nd Skull®, the manufacturer of a patented protective skull cap that fits under helmets to improve safety and mitigate the impact of blows to the head during football play, is one of three winners of the National Football League (NFL) and Football Research Inc. (FRI) HeadHealth TECH Challenge II. 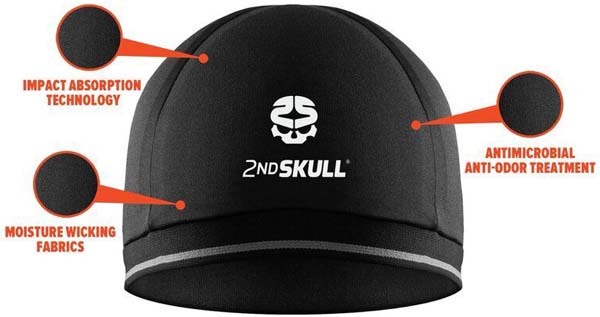 2nd Skull (http://2ndskull.com) received a $100,000 grant from the NFL to enhance and improve the skull cap in both wearability and performance. The skull cap reduces both linear and rotational impacts when worn under football and other athletic helmets, 2nd Skull said. The HeadHealth TECH Challenge which seeks proposals from manufacturers, small businesses, and entrepreneurs for innovative and protective technology to promote player safety. Started in 2016,the Challenge is operated and managed on behalf of FRI by Duke University's Clinical and Translational Science Institute (Duke CTSI). Football Research Inc. awards the most promising TECH Challenge II proposals with funding and in-kind support. "2nd Skull is honored to have been chosen to be a recipient of the NFL HeadHealth TECH Challenge II award," said 2nd Skull CEO Vaughan Blaxter, in a company release. "Our goal has always been to provide the greatest protection to all athletes, and become the ultimate safeguard for the NFL and any athlete playing sports." Manufactured in the U.S., the skull cap is a compressive, antimicrobial cap with an extra thin layer of XRD® Technology, an extreme energy absorbing material. The material is made with special urethane molecules that are soft and flexible at rest and then momentarily harden under sudden pressure. Biomechanical testing conducted by 2nd Skull at independent labs in North America and the United Kingdom is reported to have shown that the skull cap reduces both rotational and linear impact when worn under football and other athletic helmets. "We are looking at the safety needs of every athlete, and testing the skull cap to provide the greatest customized protection," said Michael Oh, M.D., associate professor of Neurosurgery at Drexel University and medical advisor to the company. "With this funding from the NFL, we will be able to gather additional impact data and optimize 2nd Skull cap materials." Football Research Inc. awards the most promising TECH Challenge proposals with a cumulative value of up to $1 million a year, including in-kind support. For TECH Challenge II, a panel of expert judges selected by Duke CTSI, in collaboration with FRI, reviewed and provided feedback on 85 proposals, all focused on improved protective equipment. Every TECH Challenge applicant is invited to reapply and receives constructive feedback from Duke CTSI biomechanical experts to help refine innovations and increase chances for success on future submissions. "The TECH Challenge series is designed to identify promising innovations that improve sports safety," said NFL Executive Vice President of Health and Safety Initiatives, Jeff Miller, in a release from the NFL. "This effort not only provides finalists with needed funding to advance these technologies, but all of those who submit proposals also receive invaluable mentorship and feedback from our partners at Duke CTSI." Other winners of the second HeadHealth TECH Challenge were Baytech Products, of Asheville, North Carolina, and Windpact, of Leesburg, Virginia. Baytech received a grant of $178,000 to build and test its prototype HitGard® multi-component helmet system concept, Windpact received a grant of $148,000 to support prototyping and testing of its Crash CloudTM, an impact liner system using restricted air flow and foam in helmets and protective gear.